This hike may seem attractive, but please keep in mind that this is a long hike, and parts of this trail are in very poor repair. 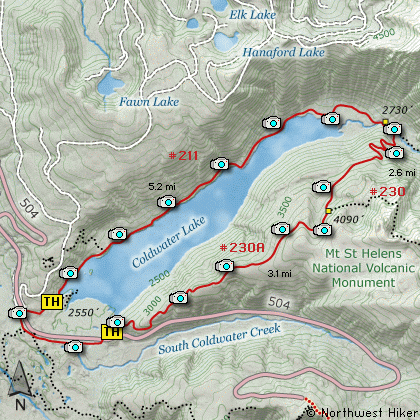 Having said that, welcome to a wonderul and exciting hike option in the Mt St Helens NVM area. I encourage you to make a loop out of this hike by beginning anywhere along the paved access road that skirts Coldwater Lake to the south. There are a number of parking areas to choose from to begin your hike around Coldwater Lake. Be sure to give yourself plenty of time, and take lots of water. I parked at the Hummocks parking area and headed east, walking the shoulder of the road to the trailhead indicated on the map. The trail then begins a steady and reasonable climb up the ridge along the east side of Coldwater Lake. Because Mt St Helens blew all the trees down, you will be out in the open most of the hike and the views are simply spectacular. As you climb the ridgeline you will catch occassional views of Mt St Helens and the surrounding peaks. In season, this is a very floral hike. In the fall you have a great likelihood of view elk. About a couple miles into the hike you will come across machinery that was blown about by the catastrophic explosion of Mt St Helens. Around three miles into the hike you will come to a junction that connects with a trail from the Coldwater Peak area. However, for this hike, you bear to the left and begin you descent into the Coldwater Creek drainage. The trail is very poorly maintained along this part, but at last report the Forest Service was working on it. As you descend into the canyon you will have incredible views of Minnie Peak and even Mt Whittier to the northeast of you. There are places where you can see Coldwater Peak also. When ou switchback your way to the bottom of this canyon there is a sturdy and rather spectacular bridge waiting for you to cross to the north side of Coldwater Creek. Once across the creek, follow the trail to your left, towards Coldwater Lake and the road where you left your vehicle. Taking the trail to the right will lead you deep into the Mt Margaret Backcountry and a long long long ways from your car. The trail now wanders along the northwestern and western shoreline of Coldwater Lake all the way back to the trailhead near the place where you began this trek. The trail is not level, but is very easy to follow and offers simply fabulous views of the lake and the surrounding peaks. In the fall the lake shore is full of brilliant colors. Drive south on I-5 to the junction of State Road 504. Exit the freeway, and turn left (east) onto SR504 and follow it east, past the Silver Lake Visitor Center and on to the Coldwater Lake Visitor Center. (closed) Take the exit directing you to Johnston Ridge, but as you descend toward Coldwater Creek, you will come to a parking area on your right. Park here and walk eastward along the paved road to the trailhead for the South Coldwater trail, which will be on your left. Drive north on I-5 to the junction of Washington State Road 504. Exit the freeway, and turn right (east) onto SR504 and follow it east, past the Silver Lake Visitor Center and on to the Coldwater Lake Visitor Center. (closed) Take the exit directing you to Johnston Ridge, but as you descend toward Coldwater Creek, you will come to a parking area on your right. Park here and walk eastward along the paved road to the trailhead for the South Coldwater trail, which will be on your left.